I’m desperate for English conversation practice! In exchange, I can be your guide in Kandalaksha. I can meet you at the train station, help you check into a hotel, recommend a place to eat, suggest places to visit, take you there, keep you from getting lost, and in every other way make you stay in Kandalaksha pleasant and comfortable. All totally free if you speak English to me and encourage me to do the same. Information Center of the Village of Chupa invites enquiries about the North-Karelian region. 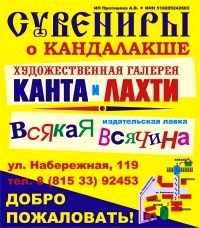 Address: Ulitsa Korguyeva 7, office 8. The Center is operated by the Karelian Regional Public Organization in Support of Sustained Development and Nature Protection “Basin Council of the North-Karelian Coast”. You may want to get close to the border to see WWII and “Winter war” artifacts like the German of Finnish cemetery by Old Salla. If so, you’ll need a special permit. This article from varandej.livejournal.com appeared to be unusually to the point, giving a comprehensive view/feel for the city. Thus I have translated/adapted it for your information and enjoyment. Here is a summary of attractions that await a hurried traveller through our town. Private museum of publisher V.P. Garkotin. By appointment only. This neat new ride sharing system is here. Asking prices Moscow to Kandalaksha are no more than $100, which is dirt cheap. Moscow to St. Petersburg is under $30. The name of the store, “Всякая всячина” (“vsyakaya vsyachina”) translates, literally, as “all sorts of all”. “Odds ‘n’ Ends” is a close English alternative. Set up by Valisi Garkotin, a publisher and a museum keeper, and managed by his daughter. Ulitsa Pyatidesyatiletiye Oktyabrya 8, across from the Belomorye hotel. Open Tue. to Saturday 10am to 6pm. Tel. : +7(81533) 94046, e-mail: kandtic@gmail.com (if important send me a copy to uncle_pasha@kandalaksha.su).